Project E Beauty makes a wide assortment of beauty products designed to reverse the ravages of time. They say their PDT LED Photon Therapy Machine rejuvenates skin with the power of light. How is this possible? This device uses low level light therapy to stimulate skin to repair itself. Different wavelengths of light penetrate to different depths in skin tissue. Some colors encourage collagen production or speed up blood circulation. As a result, skin gains elasticity and firms up, acne scars disappear, and wrinkles fade. Light therapy using LEDs actually works. Scientists working for NASA as well as medical professionals have documented positive results in multiple trials. Dermatologists use this type of treatment in their clinics. It’s not painful and doesn’t create unwanted side effects, although the treatments take longer than lasers to show results. Let’s take a closer look at the 7-Color Photon Therapy Machine to see how it works and what it can do for you. Project E Beauty's machine is compact and foldable. With 420 individual LEDs, it has more power than handheld devices that typically have less than a quarter of that number. But don’t worry that using this machine will cost you a lot more in electricity. It’s very economical, consuming just 25 watts. When you place the device on a tabletop, you can treat your face, chest, back, arms. Put it on the floor to reach other parts like legs and feet. The panel’s support arm raises and lowers and the panel itself tilts forward and backward. Depending on the colors you choose to use, you can stimulate hair growth, clear up acne breakouts, or fade away wrinkles and fine lines. The panels measure 7.09 inches tall by about 15 inches wide when the machine is opened all the way. This allows you to treat your whole face at one time in one session. Again, this is an advantage over handheld devices that only let you do one section at a time. When you unpack the light therapy device, you’ll see that it comes with a user manual to explain the specifics about how to use it. In general, it’s rather simple to use if you choose one of the three main colors. On the foot of the machine, you’ll see the power button as well as a way to control the red, blue, and yellow color balance. Pick the color that’s appropriate for the type of treatment you want to do. You can select a preset program instead if you prefer. The preset options are Program A and Program B. Both are clearly marked on the buttons. Program A gives you a 9-minute treatment that rotates through each main color for three minutes each. Program B gives you 8 minutes total, with 4 minutes of yellow and 4 minutes of blue. Once you’re ready to begin, don the goggles that also come in the box with the machine. They are just like the ones you would wear in a tanning bed. This is important so you don’t feel discomfort with the intense light that the panels emit. The device beeps once a minute while it’s working, and it shuts down automatically once the session is done. This is very nice since you’ll be wearing goggles and unable to see. But don’t worry because the light isn’t hot and won’t burn your skin. You’ll need to remain close to the panel during your treatment, within two to three inches of it. Although you won’t be able to move about, some users enjoy their time with the machine because they can listen to music or an audiobook and relax. Each of the three main colors—red, blue, and yellow—are produced by 140 LEDs each. But you can turn on both red and blue LEDs to produce purple light, for example. The user manual gives specific directions on how many button presses create each shade. You’ve seen the list of colors the machine can emit. With this device, you can fade age spots and freckles on your hands and face, erase fine lines and wrinkles, thicken thinning hair on your head, get rid of pimples, help scars heal faster, firm up a sagging chin, reduce inflammation from rosacea, and even more. UV light, environmental conditions, pollution, and age damage your skin, but LED light therapy can stimulate your body to recover from all of these problems. 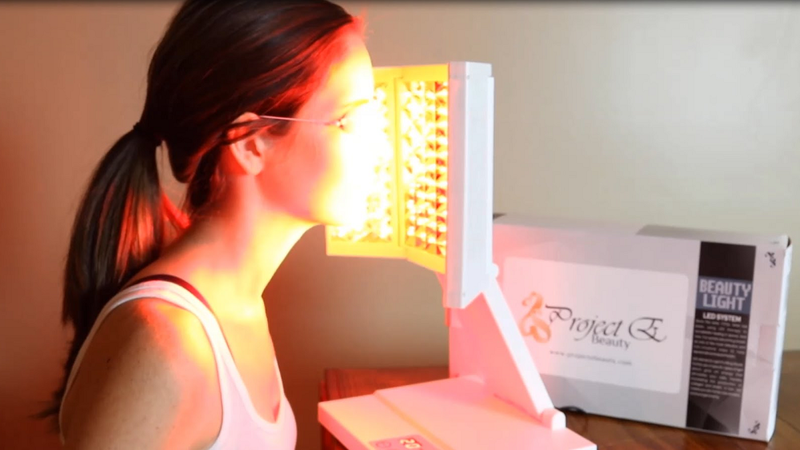 Unfortunately, the light emitted by Project E Beauty’s machine won’t treat pain. This requires infrared light, and the machine doesn’t have that feature. But the red light will help wounds heal faster, as astronauts in space discovered. Typical treatment sessions last about 20 minutes and need to be done every other day for best results. Generally speaking, LED light therapy treatments are shown to be effective when continued for 8 to 12 weeks. Some effects, like clearing up acne, might be noticeable in just a few days. Is there any way to speed up the desired results? Project E Beauty includes a sample size of their Duplex E Collagen Protein Firm Facial Body Skin Care Essence Ion Gel. Using a product like this can help your skin show results sooner. Obviously, good habits like using a gentle cleanser and effective moisturizer will also speed up your skin’s recovery. Some users combine the power of light therapy with other devices like radiofrequency skin tighteners. We’ll take a look at some of these other options in a moment. Project E Beauty covers this device with a one-year warranty. If it has a defect in the first 30 days after you purchase it, they will pay for return shipping as well. The LEDs in the panels are durable and long-lasting. They are anticipated to last at least 5 years with normal use and care. When you choose to treat your skin with low level light therapy, you’ll get more out of each session if you begin treatments with freshly washed skin. If you can exfoliate, that helps remove old dead skin to let the light penetrate better. Use a high quality lotion or moisturizer as well. Set time aside to do regular treatments. Sticking with it will give you results—light therapy is proven to work. You may want to combine the Photon Therapy Machine with one of these other devices to get faster results. If you’ve ever had a facial at a spa or beauty salon, you may have experienced a microcurrent device. The Galvanic Skin Tightening Device gives you a temporary face lift. It uses electrical current to plump up skin and make it look firmer. The current is safe (unless you have a pacemaker or other implanted electrical device) and painless. You can control the intensity, which is good for when you’ve grown accustomed to using the device. The two probes that come in the box are designed to work on your forehead, cheeks, chin, and neck as well as around your eyes and nose. The device is portable, handheld, and rechargeable so you can take it with you on the road. Instead of electrical micro-currents, the Project E Beauty RF Machine uses radiofrequency energy. RF warms up skin tissue (specifically, the dermis) to make new collagen. Of course, more collagen means firmer skin, less sag, fewer wrinkles, and better texture. The heat from the RF device doesn’t burn skin when the machine is used properly. Instead, you could see instantaneous results right after your session and during the next few hours afterward. With regular use, you’ll see even more improvement over time. Since the Fractional RF Machine is handheld, portable, and rechargeable, this is another beauty device you can take on vacation or use away from home. We hope you enjoyed this review of Project E Beauty’s Photon Therapy Device and other beauty products. Beauty doesn’t depend on invasive, expensive treatments anymore. You can achieve firmer, younger-looking skin in the comfort of your home. Check back with us soon to see new reviews of the best in skin care treatments.